As strange as it may sound, Dr. Bronner's Magic Soap really is, well, magical. Supposedly, one can use this liquid Castille soap for anything - from everyday body and hair washing to heavy-duty household cleaning. You can even (so they claim) use it as laundry detergent (1/4-1/3 cup per regular load plus a dash of baking soda). Interestingly, Dr. Bronner's Magic Soaps is embarking on an "edutainment" tour, which includes (but not limited to), a giant bathtub, a fire truck, and of course, their famous fair trade organic soap. David Bronner, Brand President calls it an "interblastive Foam Experience." My grandfather Emanuel Bronner created the liquid soap that people love today, but what is less well-known, is that my father, Jim Bronner, invented the leading Class-A firefighting foam used by firefighters in structure and forest fires across the country. The ALL-ONE Ark Interblastive Foam Experience brings together my grandfather and father's visions and allows us to share the joy of foam with thousands of people. Foam Tour participants will have an opportunity to be blasted by soapy foam as part of an ecologically friendly spa experience. If only I lived on the West Coast. My curiosity peaked, I headed to the nearest co-op to find some of this magical miracle soap to test out for myself. Thus far, I would have to say that Dr. Bronner's Magic Soap is pretty awesome. It works great as a body wash and did well as a shampoo (only requiring a few drops for either task). I tried a load of laundry using 1/4 cups of Dr. Bronner's plus a dash of baking soda (as suggested) - works great and smells minty clean. Some have recommended Dr. Bronner's as a toothpaste as well. Being the brave soul that I am, I spotted a few drops on my toothbrush and gave it a go. I'll admit, it does the job - cleans the teeth and smells like mint. Tastes like...well, soap. I ended up gargling with Listerine post brushing just to get that awful soapy taste off my tongue. 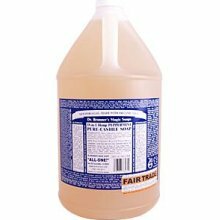 I have yet to try Dr. Bronner's Magic Soap as a general household cleaner, but I suspect it will work just fine. The drawback to this magical miracle soap is that it's on the expensive side. Probably if one were really devoted, a $50 gallon bottle would be the way to go. Any of the cleaning options (except for the laundry) requires a minimal amount of Dr. Bronner's, so a little goes a long way. Something to consider perhaps after we move cross-country...? For some reason, despite being relatively conscientious about composting and recycling, I have always had plastic bags in the house. We bring our own grocery bags to the store, but still use those thin plastic bags for produce and bulk foods. Not to mention the fact that when we go shopping for non-grocery items, we often end up carrying home a plastic or paper bag along with our purchase. 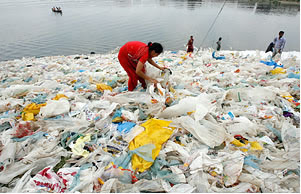 Every hour, approximately 200,000 plastic bags are landfilled and may take 1,000 years to break down. For the plastic bags that become litter, rain washes them into bodies of water where they threaten the lives of avian and marine species that can die from consuming or choking on the bags. Plastic pollution travels through our local waterways, eventually reaching the global oceans. On average, 46,000 pieces of plastic are swirling in each square mile of our oceans. Like water bottles, plastic bags harm the environment and are easily replaced by reusable alternatives. Seeing as we already have enough cloth grocery bags to last us through the next several years, I've now turned to produce bag alternatives. On the Zero Waste blog, Bea suggests Flip and Tumble reusable produce bags and organic cotton muslim bags. The produce bags are light so if the cashier forgets to tare the bag it's not a huge loss. The muslim bags are perfect for bulk dry goods (pasta, rice, nuts etc...), which we buy anyhow. These come with the tare weight written on a sewn in tag, which can easily be subtracted at checkout. Paper towels have always been a hard thing for me to let go. I don't like using old rags on my countertops, but I clean so frequently that using paper towels each time is wasteful. My goal is to start using microfiber cloths that are machine washable. Eventually I'll be able to eliminate most purchased household cleaners as well (there are effective homemade cleaners that are cheaper and less toxic). We'll see how well I can stick to my no-plastic-bags-no-paper-towels regime, but in the long-run I expect that it will save money, space and the environment. 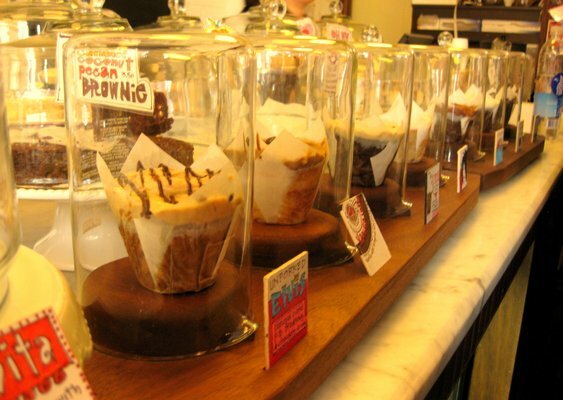 All good things. As we count down the months until our last days in Iowa (how we will miss this place!) I am faced with the prospect of whittling down our spacious and fully furnished midwest home to fit into a compact little apartment in DC. Fortunately, my husband and I are not of the packrat variety, even so, things do collect. For example, over the past two years we have amassed a decent collection of kitchen appliances (you will have to pry that ice cream machine from my cold fingers), two couches, an obscenely large flat screen TV, and other items too numerous to list. This is why I was so excited to find an article in Sunset Magazine about a family who lives a "Zero Waste" lifestyle. More on this in blog posts to come. In a lot of ways, city living will be far more sustainable than suburbia. We'll drive less, use less energy to heat and cool our home, and we'll have less stuff. Already we have started to downsize. Books we no longer want to keep are sold at a wonderful local used bookshop, The Haunted Bookshop was always one of our favorite spots downtown. Filled with a great selection of fiction, non-fiction, and children's books (along with a few friendly cats), the shop is a quiet, relaxing respite from daily life. Since the shop has recently expanded they have been especially happy to buy used books that are in good condition. Clothes that are cute and seasonal can be sold at my favorite clothing shop downtown. Revival has a wonderful mix of new and vintage pieces. Sorted by color and always fun for perusing, the racks inevitably have some treasured skirt or adorable top to try on. The shop recently set up a back area filled with adorable clothes for children and babies. And of course there is always craigslist or Goodwill for giving away furniture or other household items that we no longer want or need. Better to have someone actually use our stuff than to throw it away or haul it with us halfway across the country.